Audrey was known for something which has disappeared, and that is elegance, grace and manners. Audrey Hepburn is one of the world’s biggest fashion icons. Famous in her own lifetime and for decades since, she has come to embody a look of effortless, simple elegance that has become timeless. The iconic black dress which she wore in that scene from Breakfast At Tiffany’s over half a century ago would still turn heads today. Likewise, the amazing ball gown showcased in her transformation in Sabrina wouldn’t look out of place on a red carpet today and it still inspires many vintage prom dresses. 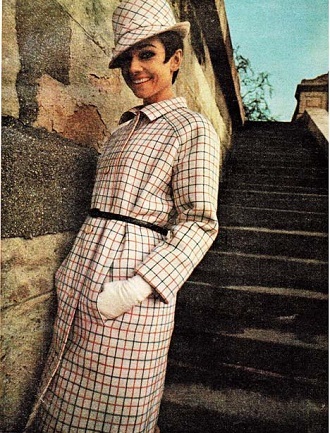 Audrey loved fashion but she didn’t see herself as a style icon. This is most obvious in her casual, everyday style where she avoided the glamorous designer look for one of simplicity. 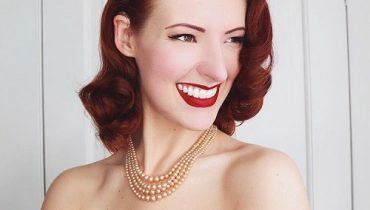 But she also knew what suited her and dressed to complement and highlight her features. 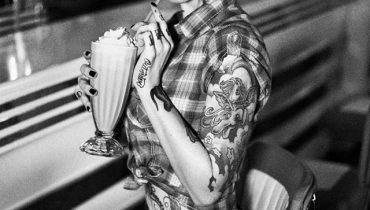 As beautiful as she was she was not the type to wear a rockabilly or pin up dress simply because it was popular in the 50s as these would not have suited her gamine look. That Audrey has come to be celebrated around the world for, among other things, her iconic fashion style is hardly surprising. But what many may not realise (we certainly didn’t) is that in many respects, Audrey was a fashion outsider when she arrived in Hollywood in the early 1950s. Gamine and petite, with a fine bone structure and a very slim figure, she did not fit the full rounded look of the 1950s when she gained her first big success with Roman Holiday in 1953. But she had an idea of what suited her, a look which she stuck to and as a result, her elegant and pared down style became iconic. Audrey is a timeless fashion icon, loved and imitated even today. So let’s look at how she got her sense of style, her integral relationship with the designer Givenchy (who designed some of her most distinctive 50s dresses), some of her style challenges and finally some of her key looks. 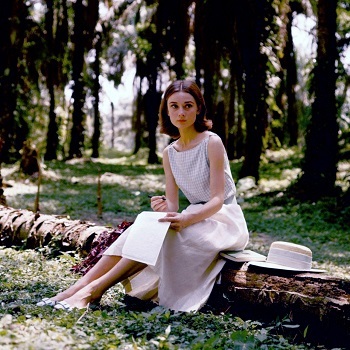 Audrey was born in Brussels in 1929. Her father was British and her mother was a Dutch baroness. She spent her childhood between Belgium, England and the Netherlands. She studied ballet for many years, however she grew too tall and went on to become a chorus girl in musical theatre before moving into acting. Her early years were marked by difficulties that would affect her for the rest of her life. She was living in the Netherlands when it was occupied by the Nazis from 1940 to 1945. During this time she supported the Resistance by performing in dance shows to raise money. Towards the end of the war the Germans withheld rations leaving the Dutch people to starve. The malnutrition she suffered in this period led to many health problems and later on a complex relationship with food. While she had a healthy appetite, she remained extremely slim throughout her life. 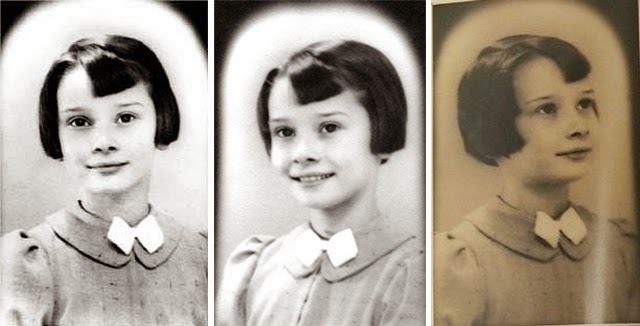 Here she is age 9, just before the outbreak of WWII. Audrey Hepburn’s first major success as an actress was in Roman Holiday in 1953. The feminine ideal at the time was represented by Marilyn Monroe, Grace Kelly, Elizabeth Taylor and Sophia Loren. These curvy and glamorous stars were light years away from Audrey’s understated elegance. Their sumptuous 50s dresses and heels were not an achievable look for many women, and so Audrey’s look provided an alternative. She represented a more elegant, uncomplicated style that seemed almost regal, just like her title role in Roman Holiday. She was of course the daughter of a baroness though the conditions she grew up in were anything but aristocratic. But it was Audrey’s personal warmth and charm and her down to earth manner that made her style at the same time approachable and accessible. 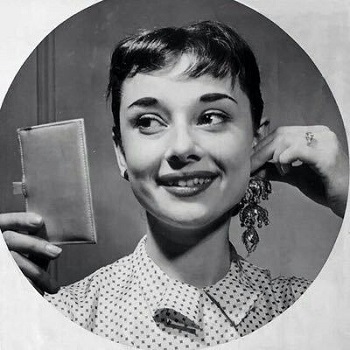 Her key look in Roman Holiday was simple. A white shirt, a long skirt cinched with a belt at the waist and a striped scarf tied around her neck. Somehow though the entire outfit comes together in an adorable way with just a few touches like the scarf and the rolled up sleeves for a casual air. 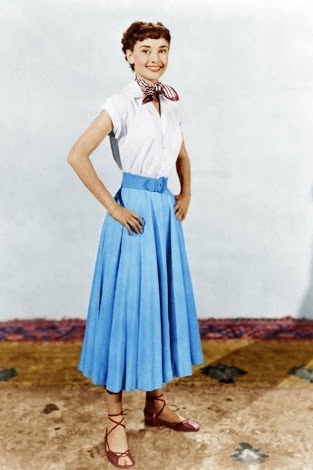 Its still a distinctly 50s look – the shirt buttons up to a V-neck collar, the skirt is full and long falling to mid-calf, the shirt is tucked in and then a belt accentuates Audrey’s (incredibly tiny) waist. She doesn’t wear any jewellery and her shoes are flat roman style sandals (of course!). The silhouette is classic 1950s and it’s a silhouette also seen on many vintage dresses from that time. Though of course, without Audrey’s own personal touches. Of course what we think of as vintage dresses or clothing now was created at the time largely by the designers of the day making their mark on the decade. 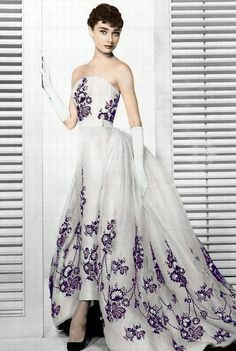 Established designers such as Christian Dior who gave the decade its defining features with his New Look Collection, up and coming young designers like Hubert Givenchy who were yet to establish themselves and famous Hollywood studio designers like Edith Head, who had already had an incredible 4 Oscars to her name when she took on the task of dressing Audrey for her role in Roman Holiday. The credit for Audrey’s look in Roman Holiday has to be given to Edith Head, who designed the costumes for the film. But Audrey’s greatest collaboration began with her next film, Sabrina. It was in preparation for that movie that she met the French designer Hubert de Givenchy who would go on to play an integral role to Audrey’s style and whose creations for Audrey would inspire many of today’s modern retro dresses. Audrey flew out to Paris to meet the French fashion designer when she was still an unknown, having just completed filming on Roman Holiday, her first Hollywood starring role (the film was yet to be released in Europe). In fact when Givenchy was due to meet her for the first time, having been told that he would be meeting Ms Hepburn, he naturally assumed that he would be meeting Katherine Hepburn. Despite this small hiccup, it was the start of a lifelong collaboration and great friendship. 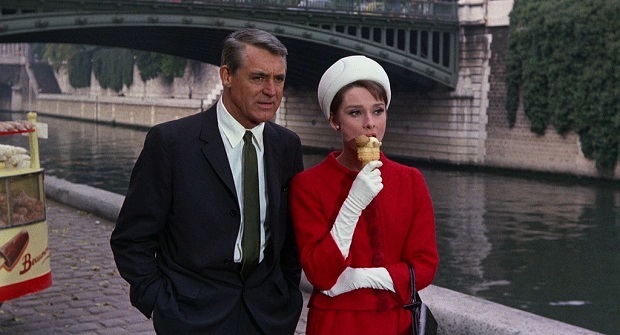 Givenchy became a significant influence on Audrey’s style on and off the screen. He dressed her for Sabrina (1954 – though officially the credit was given to Edith Head), Love in the Afternoon (1957), Breakfast at Tiffany’s (1961), Funny Face (1957), Charade (1963), Paris When It Sizzles (1964) and How to Steal a Million (1966). But he also dressed her for her real life. The other big influence which shaped Audrey’s style was her thin ballerina’s figure. 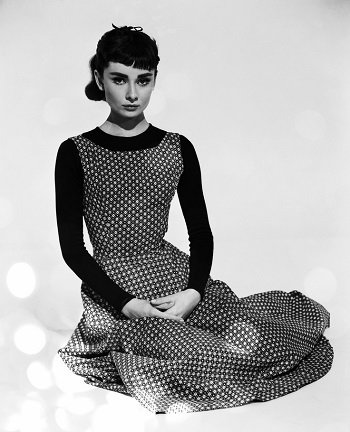 Audrey came from a classic ballet background as she trained in ballet for many years. She remained very thin for the rest of her life however rather than let this be a hindrance, she dressed to highlight her best features, often wearing clothes that suited this aesthetic more. She was the antithesis of the voluptuous, curvy look of the 1950s so popularised by stars like Marilyn Monroe, Jayne Mansfield or Gina Lollobrigida. Rather than try to compete, knowing that she had a very differently shaped body, she resisted the temptation to imitate that style, instead opting for her own look – from her pixie haircut right through to her ballet flats. However Audrey’s most iconic look is without a doubt that of Holly Golightly from Breakfast at Tiffany’s. Her iconic look from the movie is in her Givenchy designed classic, slim fit black dress, admiring the shopfront windows of the Tiffany’s jewellery store. It would be no exaggeration to say that Audrey Hepburn almost single-handedly reignited the modern trend for the Little Black Dress or LBD. The image of her in that black dress is one of understated, classic elegance so it is little wonder that this image helped to launch the ‘little’ black dress as an entire style category of its own for women around the world. 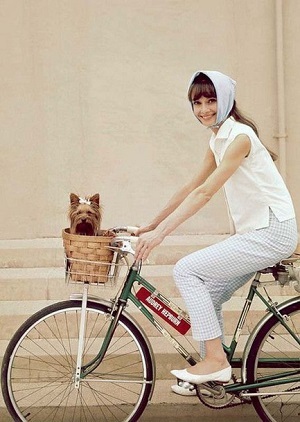 But Audrey wasn’t just about black dresses and ballet flats. She could look just as good in the popular styles of the day so to show off Audrey’s lighter side, here are a couple of pics of Audrey in polka dots, one in a quintessentially 50s dress and the other in a very 50s polka dot blouse. 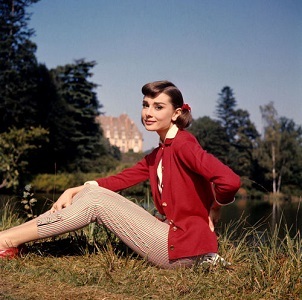 There is so much more to be said about the lovely Audrey’s style. But perhaps the best way to showcase it is to look at some of her iconic looks over the decades.